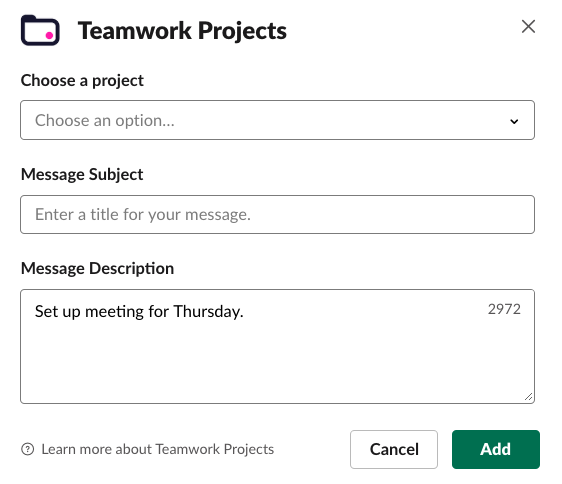 Within Teamwork Projects, you can add project items to your projects using the Slack integration. These actions can be performed on messages sent within Slack, and also on Projects notifications received in Slack. When you hover over a message or notification, you will see a menu to the right. Click the options (three dots) button to see further options for the message. You will see the 3 most recently used actions in the options menu. Click More message actions for further options. 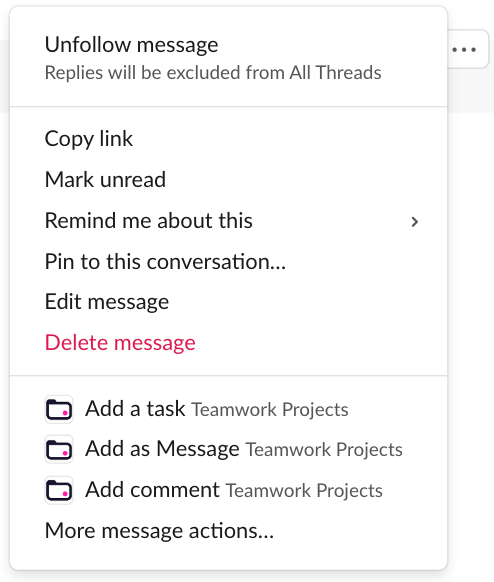 You can create a task from messages in your Slack channels, or from Projects notifications received in Slack, by selecting Add a task from the options menu. 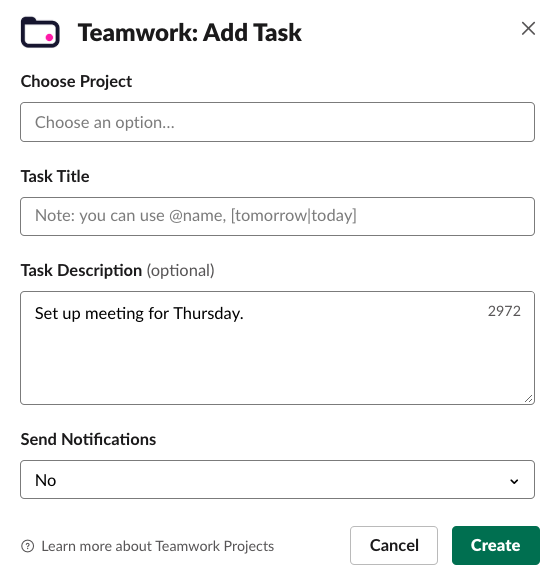 In the task modal, you will be able to choose a project to add the task to, as well as add a title and description. By default, the task description will be populated with the text from the selected Slack message. Note: You can also use shortcodes to set additional task properties. You can create a Projects message from a Slack message or Projects notification, by selecting Add as Message from the options menu. In the message modal, you will be able to choose a project to add the message to, as well as add a message subject and description. By default, the message description will be populated with the text from the selected Slack message. You can add a link to a project from a Slack message as long as the message contains a URL, by selecting Share Link from the options menu. In the link modal, you will be able to choose a project to share the link to. Note: It is not possible to share links from Projects notifications in Slack. You can add comments to the project items you receive notifications in your private Slack channel for. When you receive a notification about a comment you are notified on or @mentioned in, you can use the options (three dots) button to the right of the notification to add a reply comment. If you receive task-related notifications (updates or new tasks), you can use the Add comment action to add a comment directly to the task. For notifications about messages you are notified of or @mentioned in, you can use the Add comment option to add a reply to the message. Note: Adding comments can only be done on Projects notifications, and not original Slack messages.